#13 Lanier (0-3, 0-1) vs. #15 Jefferson (0-3, 0-1) at Alamo Stadium, 7 p.m. 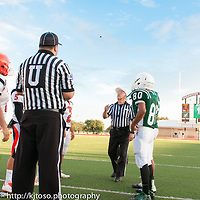 Both teams showed signs of growth against Harlandale ISD opponents last week. One will pick up its first victory tonight in this District 28-5A matchup. Lanier welcomed back senior back Joe Orta. Although Orta ran for just 33 yards in the 19-7 loss to McCollum last Friday, which was his season debut, he’s more than capable of being a big factor against Jefferson. The combination of Orta and Julian Castillo should help the Voks offset Jefferson’s steady Jesse Flores. Mustangs quarterback Weston Redding had one of the best passing games of his three-year career last Friday in a 34-25 loss to Harlandale. Redding and tight end Henry Bocko have emerged as a combination that can move the chains. For Lanier, continued growth in the passing game may be a key tonight. Turnovers have been a problem for Jefferson and Lee. Each will need to limit them to pull off their first win. The Voks have won two of the last three games in the series, which began in 1972. Series leader (record): Jefferson (25-9). 2013 score: Lanier 20, Jefferson 14. 2014 favorite: Lanier.